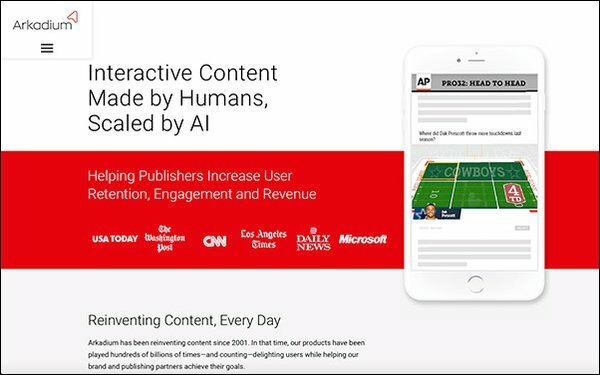 Arkadium, creator of AI-powered interactive content for over 500 publishers, like CNN and USA Today, announced a new partnership with sports data intelligence company Sportradar. The partnership provides Arkadium with a way to expand globally and break into the online betting through access to Sportradar’s well of data for AI, a sales team quipped to expand AI globally and more advertising opportunities. Additionally, bookmakers will be able to run ads across Arkadium’s AI games, allowing Arkadium to tap the sports betting market. According to Arkadium, its AI-powered technology InHabit offers bookmakers native sponsorship opportunities to drive a number of activation goals, like placing quick bets, elevating user acquisition and implementing retention initiatives. Through its partnership with Sportradar, Arkadium noticed a lot of interest coming from its EU-based publishers looking for new betting opportunities. As sports gambling becomes more mainstream, Arkadium saw an opportunity to be at the forefront of the movement with its U.S.-based publishers. In the exclusive agreement, Sportradar and Arkadium will create factives for English Premier League matches and UEFA Champions League matches in numerous languages, in addition to the NBA, NFL, MLB and NCAA football and basketball. Ads run through the partnership will be similar to Arkadium's current ad offerings, which support categories like retail and auto-branded factives across publishers’ sites. Publishers receive a portion of the spend. In a pilot program of its InHabit advertising software, fashion retailer DXL showed an average of 21.6 second dwell time, in addition to in-target engagement of 90% across DXL’s core demographic.